A highly detailed map of the Pacific Northwest that predates the establishment of the Oregon Territory. Map of the United States Territory of Oregon West of the Rocky Mountains, Exhibiting the various Trading Depots or Forts occupied by the British Hudson Bay Company, connected with the Western and northwestern Fur Trade. This is an important and scarce 1838 map of the Oregon Territory by Captain Washington Hood. Prepared to 'illustrate the report of Senator Linn on a Bill to authorize the President to occupy the Oregon Territory', this map covers present day Oregon, Washington, Idaho, Montana, Wyoming, California, Utah, Nevada, and British Columbia. Based on Arrowsmith's 1834 map, with relevant updates, it extends from the Dixon Entrance in Canada south along the Pacific coast to Monterey Bay and from the Pacific Ocean eastward to the Rocky Mountains. 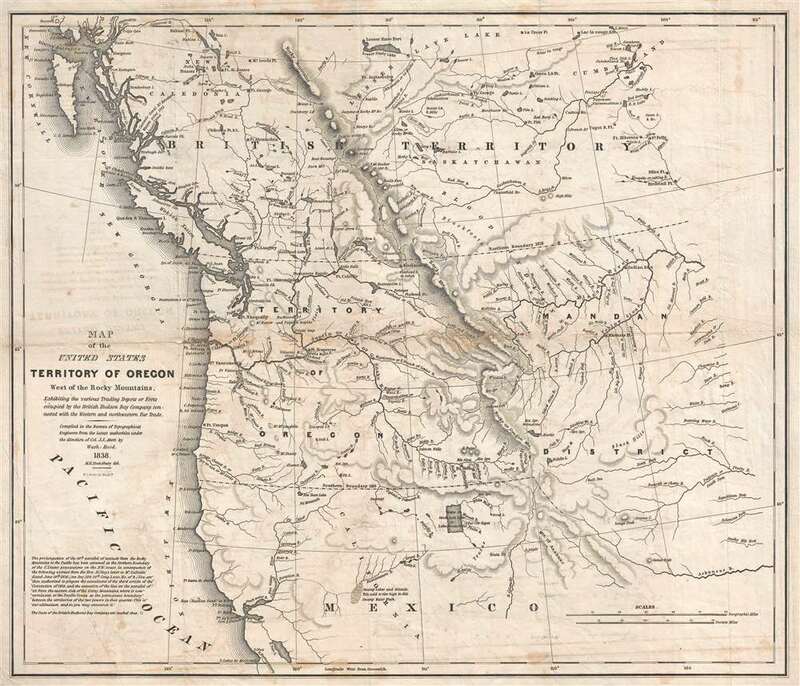 The map predates the official establishment of the Oregon Territory, and, unlike Arrowsmith's map, sets the northern boundary along the 49th parallel as per the 1818 compromise, while the southern border reflects the boundary settled in Addams-Onis Treaty of 1819. In 1818, United States and Britain agreed to joint occupancy of the Oregon County. Both the British, in the name of the Hudson Bay Company, and the Americans, championed by John Jacob Astor's Pacific Fur Company, were eager to claim monopolistic right over the region. Astor's establishment of Fort Astoria on the Columbia River, identified here, only served to further tensions with the Northwest Company - the Pacific subsidiary of the Hudson Bay Company. The dispute would escalate, giving rise to the Oregon Boundary Dispute and the American expansionist slogan 'Fifty-four Forty or Fight!'. The dispute was not resolved until the 1846 Oregon Treaty which, through concessions on both sides, formally set the boundary at the 49th parallel. Cartographically, the map features several interesting elements. The Great Salt Lake or the Youta or Lake Bonneville, is curiously oblong in shape. The Gourd River southwest of Salt Lake becomes the Buenaventura River, flowing into 'Swamp Lakes and Islands'. A second Buenaventura River runs north into Monterey Bay. The Buenaventura is the last incarnation of the apocryphal River of the West, a long sought-after speculative alternative to the Northwest Passage. Various posts of the British Hudson's Bay Company as well as the American Fur Company are noted throughout. The map also shows Lewis and Clark's route from Missouri headwaters to 'Canoe Camp' near the Lewis (Snake) River. It is also important to note that the complex river system present throughout the region is illustrated in detail. This map was compiled in the Bureau of Topographical Engineers from the latest authorities under the direction of Col. J. J. Abert. The engraving was executed by by W. I. Stone after M. H. Stansbury. According to Senator Linn, this map was 'believed to be the most correct and furnishes the most recent and authentic information of any yet published'. The map accompanied the historically important Report of Mr. Linn, Senate Document No. 470, 25th Congress, 2nd Session, dated June 6, 1838, to Accompany Senate Bill No. 206, to authorize the President to occupy the Oregon Territory, and was later re-issued in other reports. A map of historic significance, making it one of the most desirable maps of the region. Washington Hood (February 2, 1808 – July 17, 1840) was American army officer in the Corps of Topographical Engineers. Hood was born in Philadelphia, Pennsylvania, the son of John McClellan Hood, a wholesale grocer. Hood attended West Point, from which he was the 500th graduate, matriculating with in the class of 1827. Between 1831 and 1846 he completed various topographical surveys in Missouri and Florida (Seminole Wars?). He next worked with Robert E. Lee measuring the Ohio-Michigan line. In 1836, Hood resigned his military commission to work as a private civil engineer. He spent much of 1837 in Cuba, where he performed railroad work. He rejoined the military as a Captain in 1838 and in that year produced his landmark map of Oregon territory. In 1839, President Van Buren sent him to survey the Oklahoma Shawnee lands between the Arkansas and Missouri River. During this assignment, he contracted an unknown illness from which he died less than a year later. A large archive of his important sketches and manuscripts are preserved at the Winterthur Library in Delaware and Beinecke Rare Book Library, at Yale. Report of Mr. Linn, Senate Document No. 470, 25th Congress, 2nd Session, dated June 6, 1838, to Accompany Senate Bill No. 206, to authorize the President to occupy the Oregon Territory, (Washington) 1838. Very good. Wear and toning along original fold lines. Light transference. Verso repairs to fold separations. Blank on verso. Wheat, Carl Irving, Mapping the Transmississippi West, 1540-1861 (5 vols), 434.